Does Kensington Island Properties Resemble What We Were Told in 2005? We were ripe for the picking. A community with a population easily fooled who believed a developer was going to GIVE Union Bay a new water treatment facility, 3,500 more people NOT 3,440 doors, sewage treatment, and on and on. For those who weren’t here in those years, Langley Lake was initially proposed as a temporary water source, then Bob Long assured landowners Langley Lake wasn’t even being considered and then the Regional District changed the source to Langley Lake for the entire development. 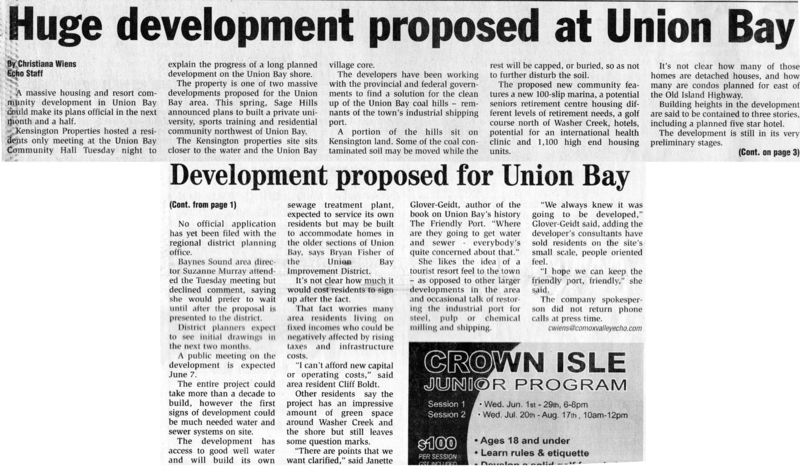 Plans for the development were released to the media Wednesday after two private open house meetings in Union Bay. Reporters were asked to leave or not attend both meetings. The water for homes, golf course and development will come partly from Langley Lake which will could see a longer intake pipe and new dam onsite for a cost of $1.5 to $2 million. Kensington has also found underwater aquifers on site and may consider creating a second lake to help supply water into Washer Creek, a salmon habitat. “We are not looking for money,” said McMahon. Calling the company a Canadian Corporation “based in Courtenay” McMahon says its primary shareholder Jim Youngren had lead several successful developments in Canada and the U.S.